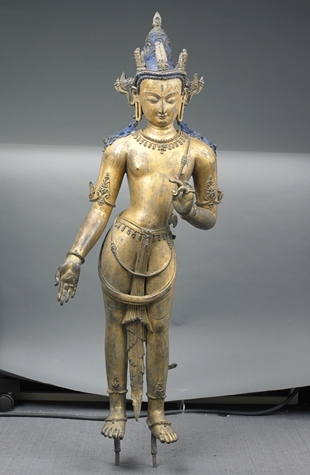 While the art of Tibetan Buddhist Statues was absorbing foreign art in Tubo Dynasty period, it also paid attention to the integration with the local Tibetan artistic factors, which is revealed in this statue. 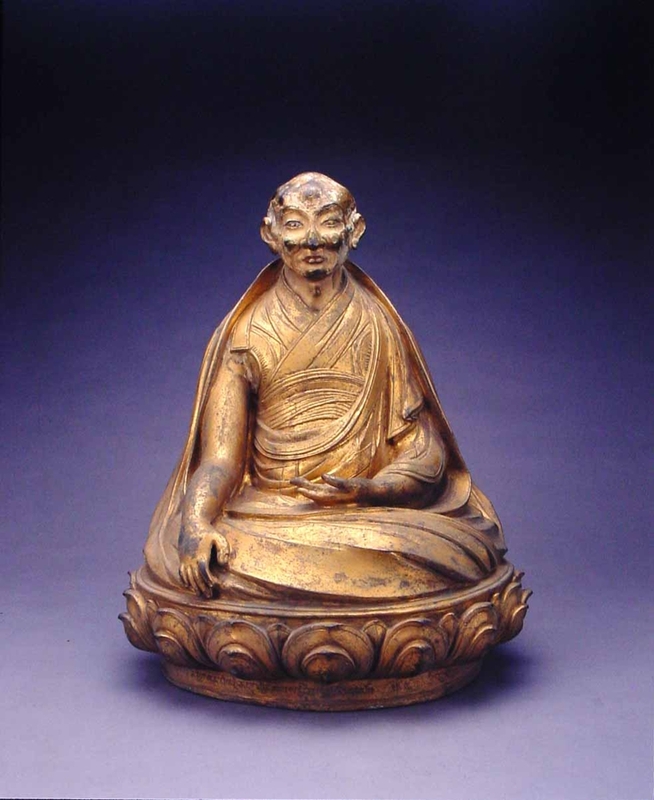 While the art of Tibetan Buddhist Statues was absorbing foreign art in Tubo Dynasty period, it also paid attention to the integration with the local Tibetan artistic factors, which is revealed in this statue. The figure wears a triple crown, with a dignified and charming face. He wears a collar robe, with pleated ribbons on both sides of thighs. 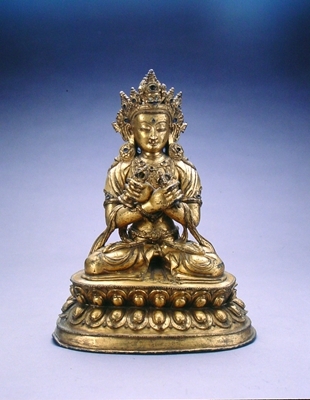 His hands are raised on the chest, holding the stem and the lotus open at the shoulders. A grand oval nimbus, whose outer edge has jagged flame light can be seen behind the statue. He wears high boots, stepping on large round padmasana. The style was affected by Nepal art significantly, but the style of the dress was from the upper nobilities of Tubo. 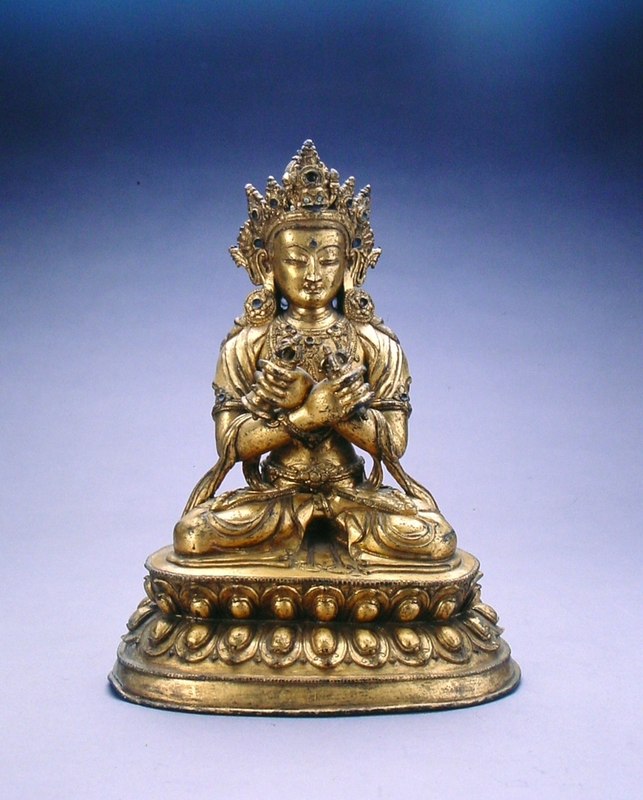 This statue has great values in studying the Statues of Buddha and fashion culture in Tubo period of Tibet. This statue is an imitation of the palace-style. The crown, face, decorative style, expressing techniques of garment outlines and the overall shape, are basically the same as the palace statues of Yong Le and Xuan De in Ming Dynasty. This statue is an imitation of the palace-style. The crown, face, decorative style, expressing techniques of garment outlines and the overall shape, are basically the same as the palace statues of Yong Le and Xuan De in Ming Dynasty. There are engraved inscriptions on the edge of padmasana, indicating that this statue was from the civilians not the palace. The most remarkable feature of this statue is that the figure's left hand holds a bell, and the right hand holds a pestle. 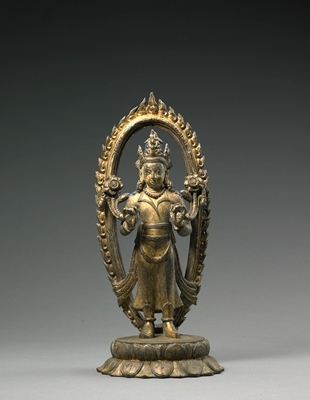 Four-armed Avalokitesvara is the important worship god of Tibetan Buddhists; and is considered as the "Snow Manjushri". 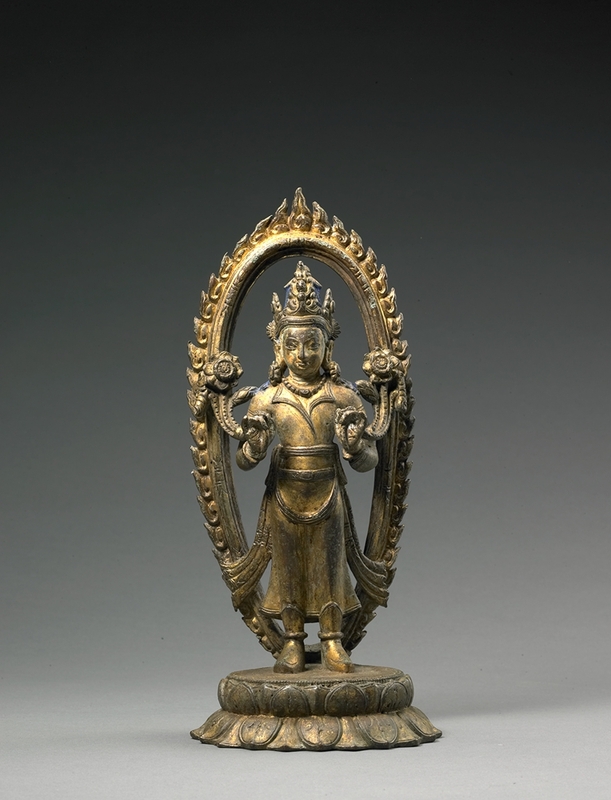 Four-armed Avalokitesvara is the important worship god of Tibetan Buddhists; and is considered as the "Snow Manjushri". The figure sits in cross-legged posture, wears a crown on the head, with a crown knot crossing out of the ears, and with rolling silk fabrics. The figure has plump cheeks, and the deep set eyes which are widely open. The upper body bares, decorated with collars, armlets and bracelets, and the belt of meditation hangs on the left shoulder, and the lower body is dressed in a thin skirt. The two hands in the middle are clasping together, the other two hands are holding on both sides of the body, the right hand holds a rosary and the left hand holds a lotus. 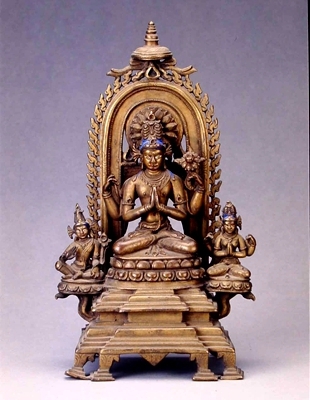 By the left and right sides of the main statue there are a statue of Four-armed Avalokitesvara sitting in cross-legged gesture, and a statue of Padmapani sitting in playing gesture. Under the lotus throne there is a polygonal contraction corbel style pedestal, on the behind there is a large nimbus with boat-shaped flame pattern decorated with round canopy on the top. 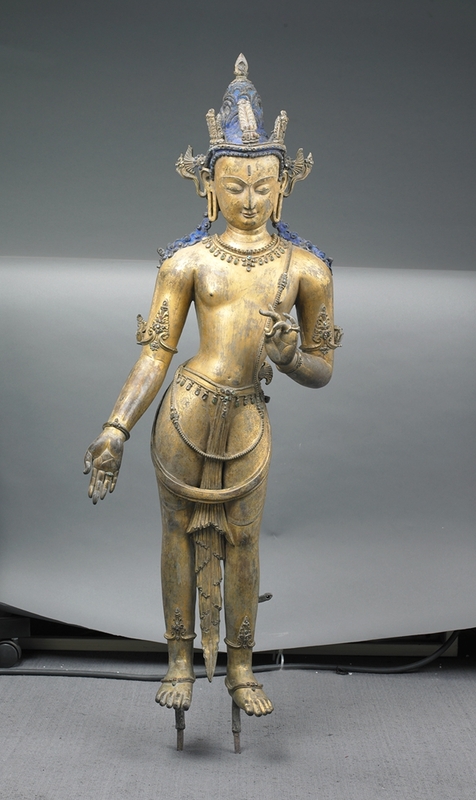 The whole statue is extremely beautiful, reflecting the distinctive characteristics of Indian Pala statues. The fourth Panchen (AD 567-1662), whose Buddhist monastic name was Losang Choskyi Gyaltsan, was one of the most influential eminent monks in Tibet's political and religious history. The fourth Panchen (AD 567-1662), whose Buddhist monastic name was Losang Choskyi Gyaltsan, was one of the most influential eminent monks in Tibet's political and religious history. This statue sits in cross-legged posture on padmasana, without a crown on his head, the back of the head is oddly big, and a a swelling on his forehead; his eyes wide open, with a straight nose closed lips, a sharp jawand high cheekbones. He wears monk dress inside, kasaya and monk cloak come next, with the right shoulder bare. The clothes grains are smooth and vigorous. . His right hand puts on the right leg touching the ground, and his left hand sets under the belly button in meditation gesture, and the overall image is strange and realistic which vividly reveals the outstanding features of the Fourth Panchen, and it is a highly artistic portrait statue. There are carved inscriptions of Tibetan, which shows that inside this stature, there is the sarira of the Fourth Panchen, and his merit is incomparably excellent. Amitabha is the leader of the Western Paradise claimed by Buddhism. The figure has spiral hair, with a high spherical bun on the top, and the face is dignified. Amitabha is the leader of the Western Paradise claimed by Buddhism. The figure has spiral hair, with a high spherical bun on the top, and the face is dignified. He wears a kasaya with a bare right shoulder, and the clothes grains are natural and smooth. He sits in cross-legged posture, with hands putting in a meditation gesture. Under the body there is a waist style lotus throne supported by a four-legged seat bed, and with carved inscriptions on the seat bed. There is a large boat-shaped nimbus behind the figure, whose inner rings were carved with lotus petals and outer rings carved with flame patterns. The whole statue has perfect shape with delicate techniques. 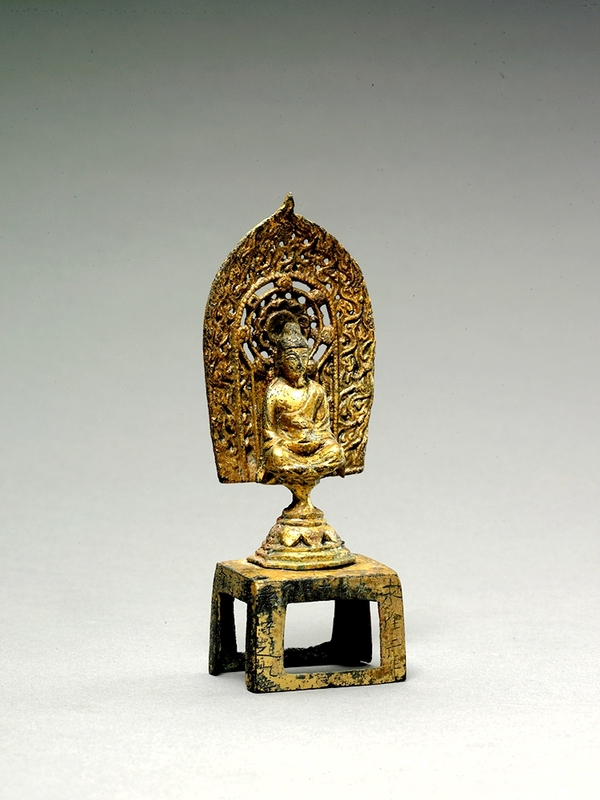 It is a rare top quality Buddhist statue in Tang Dynasty. 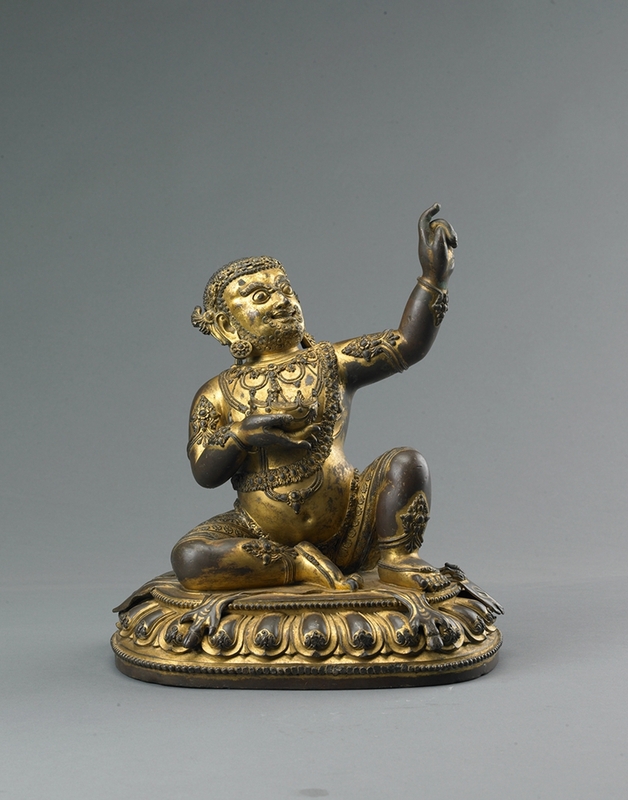 Birwapa is one of the 84 Indian Mahasiddhas, and is the important guru enshrined by Sa-Skya-pa of Tibetan Buddhism. 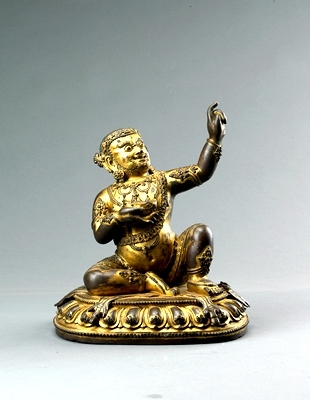 Birwapa is one of the 84 Indian Mahasiddhas, and is the important guru enshrined by Sa-Skya-pa of Tibetan Buddhism. He wears a crown, with a round face, round and prominent eyes, and the image looks mighty. He bears a spiral beard on his cheek and chinwith big ring lobes under his ears, a typical Indian face. His upper body wears a collar, with jeweled necklaces and strings of ornaments on the chest; his lower body is covered with animal skin, and his wrist, arms and feet are decorated with bracelets. He sits in playfully with natural and strong arms and legs. His right hand is holding a skull bow lnear his chest, his left hand is holding high, with his index finger pointing to the sky, indicating the story scene of Birwapa’s holding the sun by his hand when he bets with the woman selling liquor. There are inscriptions engraved on the base of the statue with characters of Da Ming Yong Le Nian Shi. The whole statue is tall , with a high artistic level, and is a rare masterpiece of palace statues in Ming Dynasty. The figure wears three-leave-shaped crown, wearing his hair in a high bun, and a fan-shaped crown knot crossing out of the ears. And there is rolled U-shaped silk fabrics,with the excess hair drooping on the shoulders. The figure wears three-leave-shaped crown, wearing his hair in a high bun, and a fan-shaped crown knot crossing out of the ears. And there is rolled U-shaped silk fabrics,with the excess hair drooping on the shoulders. The face is long and round with square urna decorated between the eye-brows. The image looks dignified. The upper body is bare, with collars, jeweled necklaces and strings hung on the neck, with a connected holy belt on the left shoulder. The lower body is dressed in a thin skirt, with pleated drooping belts between the legs, and the limbs decorated with bracelets. Thefigure is standing in S-shape naturally; the muscles are plump and elastic, with left hand putting on the chest, and right hand drooping fearlessly . The whole shape and the decorative pattern reflects the typical style of the Indian Pala statues. 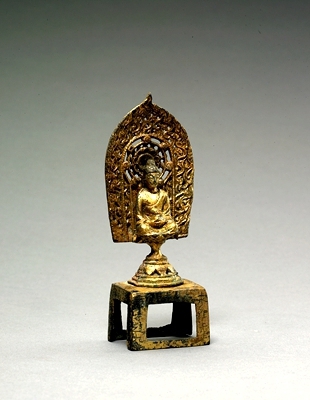 It is a rare treasure of the early Tibetan Buddhist statues. 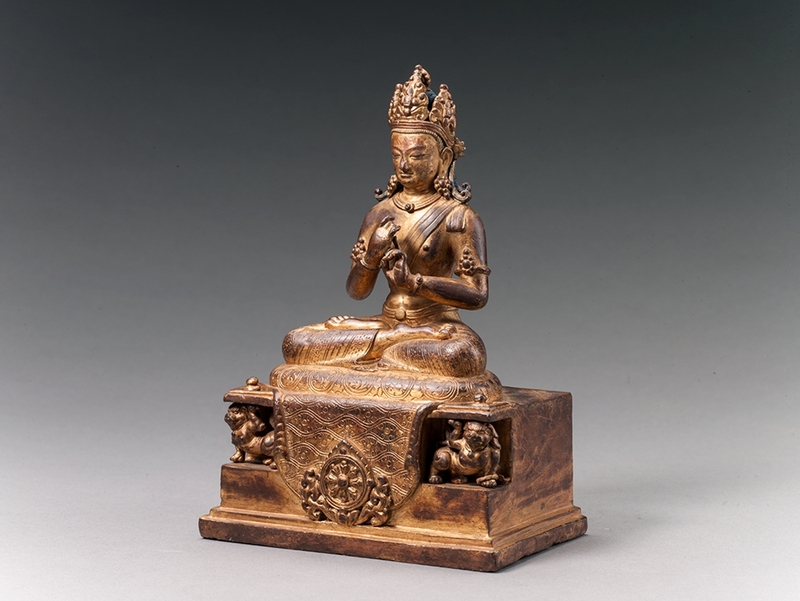 After the initial period of Tibetan Buddhism, Nepal Buddhist statue art continued to affect Tibetan area. 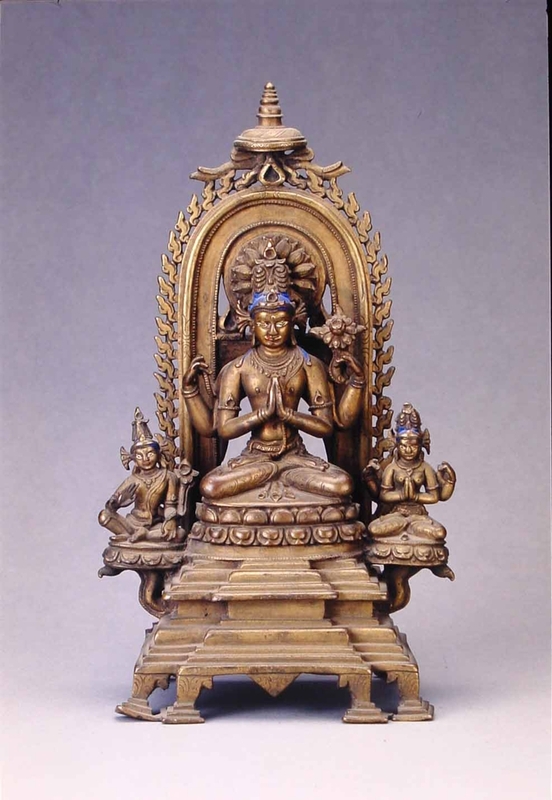 After the initial period of Tibetan Buddhism, Nepal Buddhist statue art continued to affect Tibetan area. 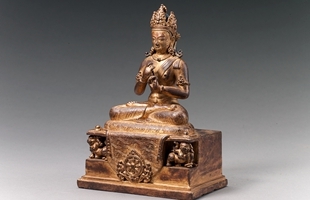 During this period, Nepal Buddhist statue art had entered a mature stage, and the statues of Buddha are vivid and graceful, their garment lines are simple, most with copper casting, with their cores thick and bodies heavy, and were in fine casting processes. It was a custom to decorate the lotus thrones with large lotus petals, with generous shapes, showing a high artistic level. These statues reflect the features of Nepal statues during that period.